The centerpiece of the school’s 19-acre campus is the former Ponce de Leon Hotel, which was listed on the National Register of Historic Places in 1975. The hotel was known for its opulent setting and luxurious amenities. Many millions of dollars have been spent renovating and restoring the historic buildings, and visitors as well as students spend many hours just enjoying the ambiance. Today more than 2,000 students come to engage in educational pursuits ranging from the fine arts to accounting and business and many in between. Henry Flagler, co-founder of Standard Oil, envisioned St. Augustine as an American Riviera. In that spirit, he built the ornate Ponce de Leon Hotel on land that was once an orange grove. Capturing the essence of Old Europe, the Spanish Revival-style building adorned with Moorish Revival architectural elements was designed by John Carrere and Thomas Hastings. The construction began in 1885 and ended in 1887. The building was the first major structure in the country to have a poured concrete foundation. The hotel also had steam heat. The grandeur of the building would influence architecture in southern Florida for the next half-century. Sparing no expense, Flagler hired Louis Comfort Tiffany to design the interior spaces. Many of his beautiful stained glass windows are still present in the dining hall along with angelic figures representing the four seasons and a large painting depicting a Spanish Galleon under full sail. This is a representation of the sailing ship that brought Ponce de Leon to Florida in search of the Fountain of Youth. The hotel was one of the first buildings in the nation to be wired for electricity. Staff members would turn the lights on and off in the rooms because guests were often afraid to flip the switches. Frank Thompson, the hotel’s headwaiter in the late 1800s, was a pioneer in the Civil Rights Movement and an organizer of the Cuban Giants, a professional black baseball team. Prominent personalities like Mark Twain, President Theodore Roosevelt, Babe Ruth and Babe Didrikson frequented the hotel. An artists’ colony was established when Flagler erected studios at the rear of the hotel. The studios attracted prominent artists, including Martin Johnson Heade, Felix de Crano and Reynolds Beal. During the Depression, the federal government sponsored arts programs at the property that were attended by Robert Frost, Ernest Hemingway and Marjorie Kinnan Rawlings. One of the few Flagler hotels to survive the Great Depression, the property was commandeered by the U.S. Coast Guard during the Second World War for use as a training center. The hotel and city are considered the birthplace of the Coast Guard Reserve. Several thousand recruits received their training here, including the celebrated African-American artist Jacob Lawrence. He would later serve on the USCGC Sea Cloud, the first integrated ship in naval service. The twin towers were originally storage tanks designed to supply the hotel with running water. One of the towers was converted and used as a brig by the Coast Guard. During the early Civil Rights Movement, the hotel dining room was the scene for a 1964 sit-in, the first major demonstration in St. Augustine. Four years later, the hotel would become the showpiece of the newly established Flagler College. The school would spend millions of dollars restoring the building to its original glory. The historic hotel, now a dormitory for female students, is open for public tours. Historic Tours of Flagler College highlight the architectural heritage of the former Hotel Ponce de Leon, listed as a National Historic Landmark. A tour of the college enables you to journey back to the Gilded Age and experience an opulent turn-of-the-century hotel. Reservations are not required, but you should arrive at least 20 minutes before one of the scheduled twice-daily tours, which are led by student guides. These tours highlight the architectural heritage of this designated national landmark. Guests will begin their tour by exploring the courtyard while learning of the hotel’s Spanish Renaissance architecture and of the techniques and innovations used to construct Henry Flagler’s vision. Next is the grand lobby and rotunda where they will look up into a 86-foot domed ceiling supported by eight oak caryatids hand carved with robed women, each slightly different from the next; these figures are copies of those in the temple of Diana in Greece. The Rotunda features an intricate mosaic floor and walls adorned with elaborate paintings and murals by George Maynard. Guests will move on to the dining room where the stained glass windows stream light onto the beautifully hand painted murals on the walls and ceilings. Finally, they will visit the Flagler Room, formerly the Women’s Grand Parlor, where they will gaze upon hand crafted Austrian crystal chandeliers, a clock containing the largest piece of intact white onyx in the western hemisphere and crafted by Thomas Edison, original hotel furniture and art, magnificent wall panels, detailed plaster carvings as well as personal photos and mementos from Henry Flagler and his family. The school also offers a special tour of the Solarium on Saturdays and Sundays during June and July. The floor-to-ceiling windows in the fourth-floor parlor over the Rotunda offer magnificent panoramic views of St. Augustine. Tickets for the tour can be purchased at Flagler’s Legacy Gifts on St. George Street or in the lobby gift shop. The admission fee is $10 for adults. The college offers discounts for children, senior citizens and military personnel. Boasting a history stretching back almost 500 years and warm, sunny weather, St. Augustine is a prime vacation destination. The most popular time to visit this pedestrian-friendly city is the end of February until the beginning of June which is also when the weather is most pleasant. While the summer can be sultry and often features brief afternoon thunderstorms, the temperatures during the fall and winter months can drop suddenly due to a cold snap. Be sure to dress in layers during the cooler months of the year, which is also the dry season. Weekends are usually more crowded than weekdays. The streets of downtown St. Augustine are narrow and can be congested with cars. There is also limited parking. The best way to reach Flagler College is the Old Town Trolley. You can avoid the frustration of driving in congested city traffic and trying to find a place to park. On an Old Town Trolley Tour, you can sit back and relax as you hear a fun and informative story about the many points of interest that you will pass along the way. 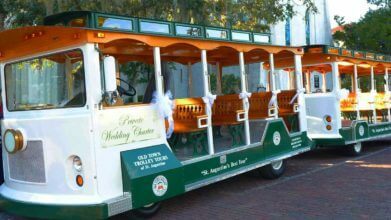 Step off the trolley and visit this historic landmark at your leisure. When you are ready, you can climb back aboard the next trolley. One comes along every few minutes. The Old Town Trolley is a safe, affordable and convenient way to see the best that St. Augustine has to offer. The oldest city in the United States, St. Augustine is filled with museums, heritage architecture and unique attractions. Several of these are within a block or two of Flagler College. Housed in the historic former Alcazar Hotel, the Lightner Museum boasts a collection of mostly American Gilded Age pieces. In addition to Victorian art glass, the museum features mechanized musical instruments that date from the 1870s through the early 20th century. The Spanish Renaissance Revival-style building was added to the National Register in 1971. Inspired by Granada‘s 12th-century Moorish Alhambra Palace, the Villa Zorayda is a historic house museum built in 1883. The residence is furnished with art, antiques and Franklin Smith family heirlooms. Listed on the National Register, the home also features Oriental rugs, Egyptian artifacts and brass lamps from Damascus. Completed in 1797, the Cathedral Basilica of St. Augustine is a National Historic Landmark and the oldest church in Florida. The congregation was originally established in 1565. The building’s façade features Spanish Colonial and Renaissance Revival architectural design elements. The tower is believed to house the oldest church bell in the country. The artisan San Sebastian Winery honors American wine making that began in St. Augustine in 1562. Located in an Old East Coast Railway building, the winery is known for its table, sparkling and dessert wines created from Florida-grown grapes. A tour of this award-winning winery enables you to learn about the complete wine-making process.